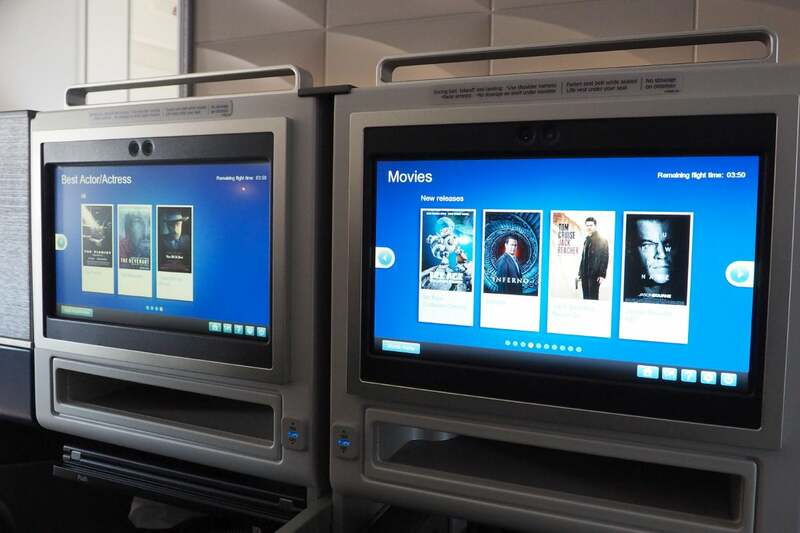 Yesterday, United operated a special “preview flight” on its 777-300ER, which enters passenger service this Thursday. TPG and I had a chance to fly on this charter (along with 60 or so employees and guests) from Chicago to San Francisco, giving us four hours to experience the full long-haul Polaris service (including amenities like mid-flight snacks and pajamas), chat with United execs and explore the plane. TPG policy is to cover all costs related to travel — while we paid for our flights to Chicago and from San Francisco, unfortunately it wasn’t possible to book a revenue fare (or award ticket) on the charter. 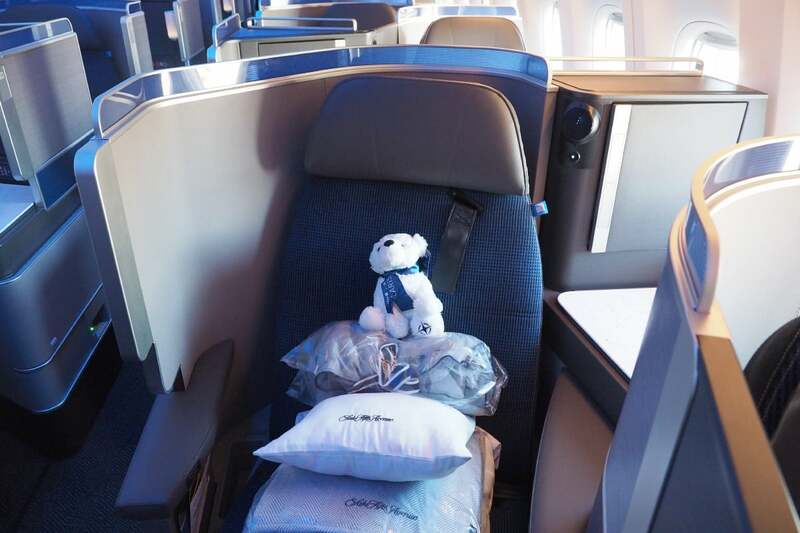 So, since we couldn’t pay for the flight, we’ll be giving away two one-way award tickets in United Polaris to any destination with Saver availability — stay tuned for more details about that incredible giveaway! I arrived around 9am. 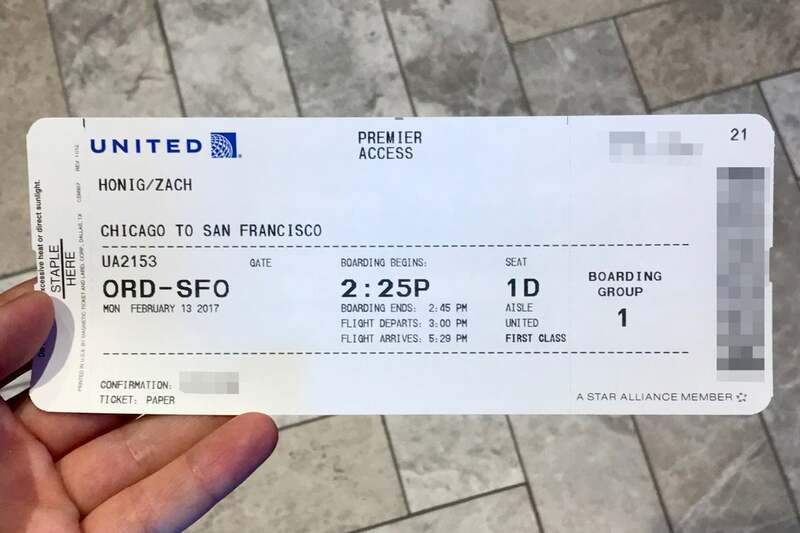 following a flight from Philadelphia, at which point a United rep handed me my boarding pass for the charter flight (no, it wasn’t eligible to earn miles, unfortunately). 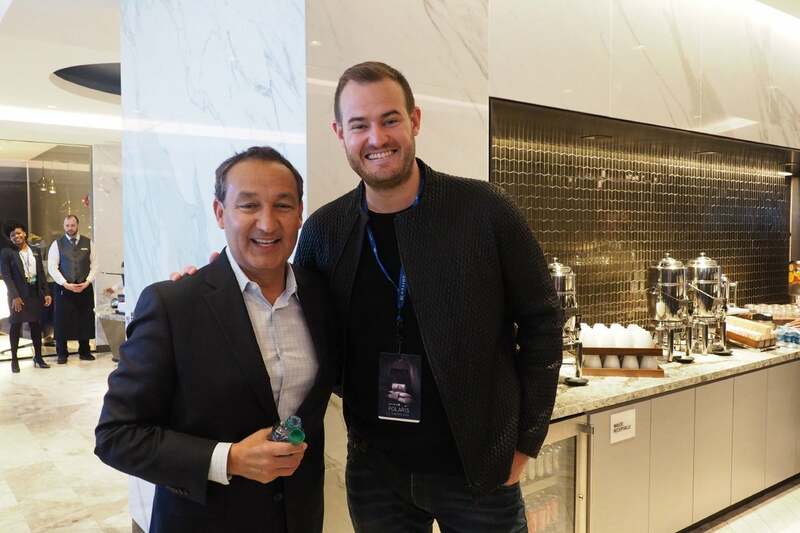 Brian had a chance to catch up with United CEO Oscar Munoz in the lounge before it was time to head to the gate. 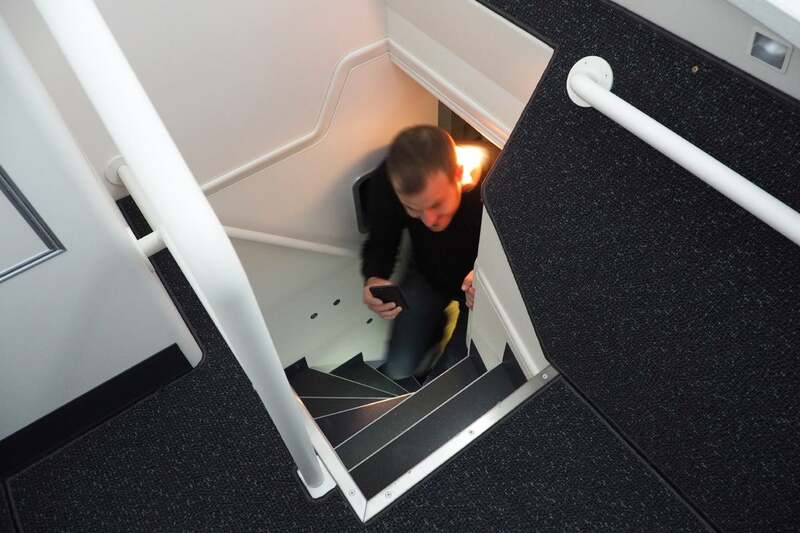 While the 77W is very roomy inside, the same can’t be said for the aircraft door — TPG bumped his head while attempting to board. 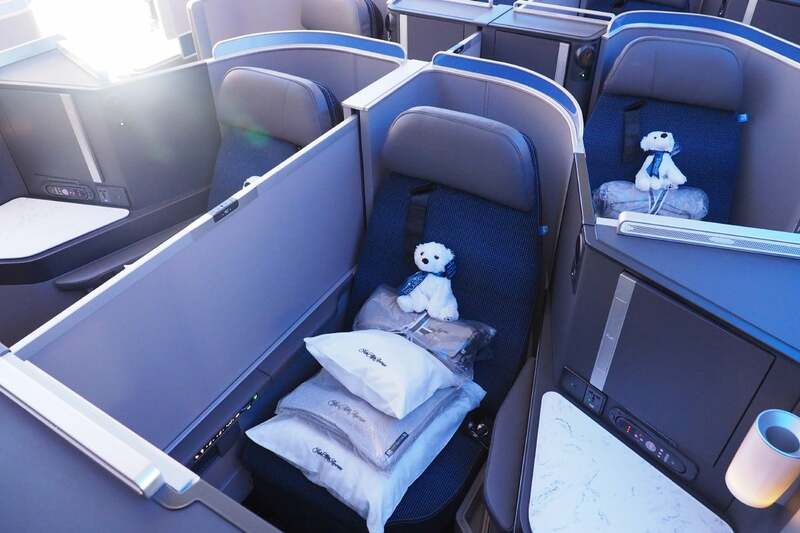 The 60 Polaris seats are split between two cabins — we turned left to find our seats in row 1. 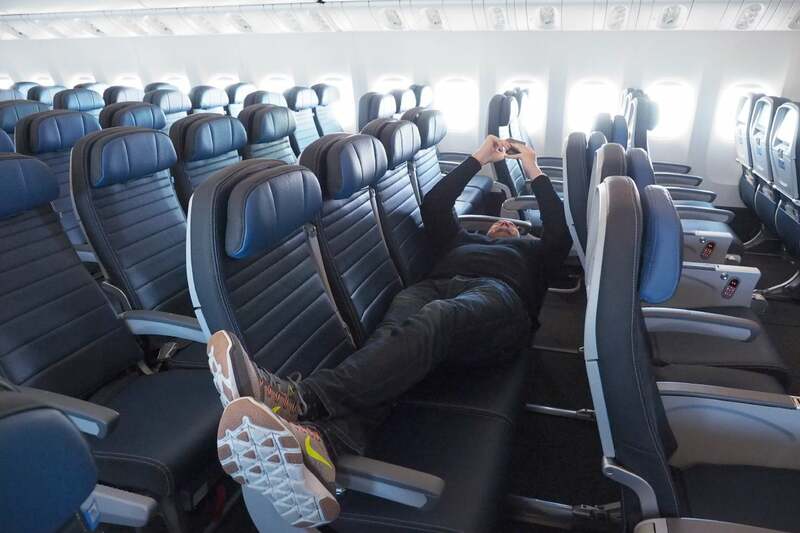 There’s not a ton of storage space in the new seats, unfortunately (more on that tomorrow), but with far fewer passengers per bin, there’s plenty of overhead storage to go around. TPG and I were assigned seats 1D and 1G, in the middle section at the very front of the plane. 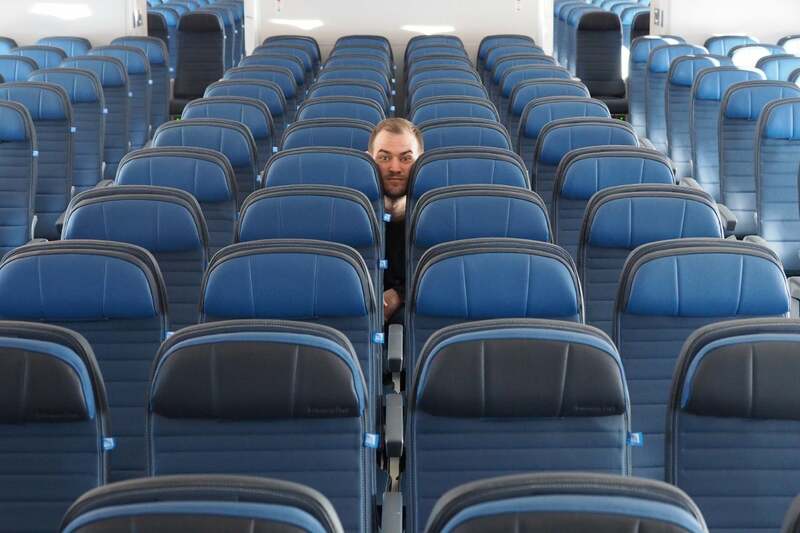 Middle seats in odd-numbered rows are ideal for passengers traveling together, given how close they are to one another, but a motorized center partition adds privacy at the touch of a button. 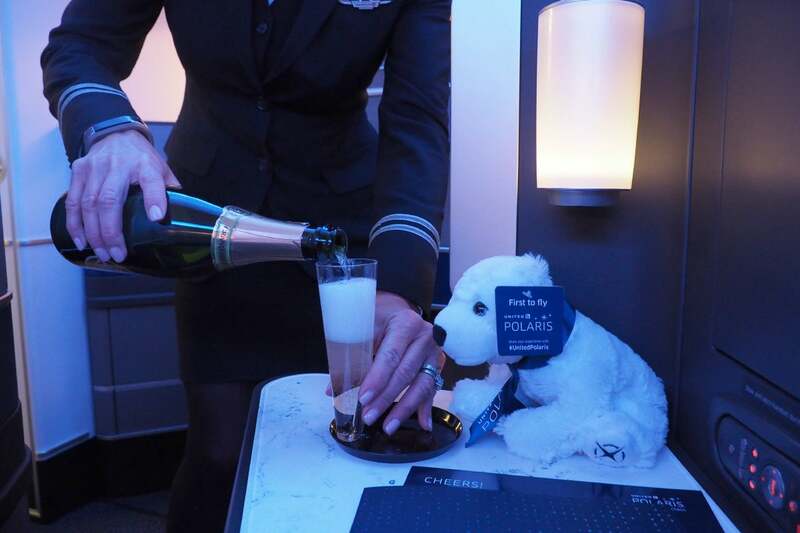 While only Polaris first (on United’s 747s and 777-200s) typically includes turn-down service, the flight attendant was kind enough to tuck TPG in for this photo. Did you notice TPG’s pajamas? 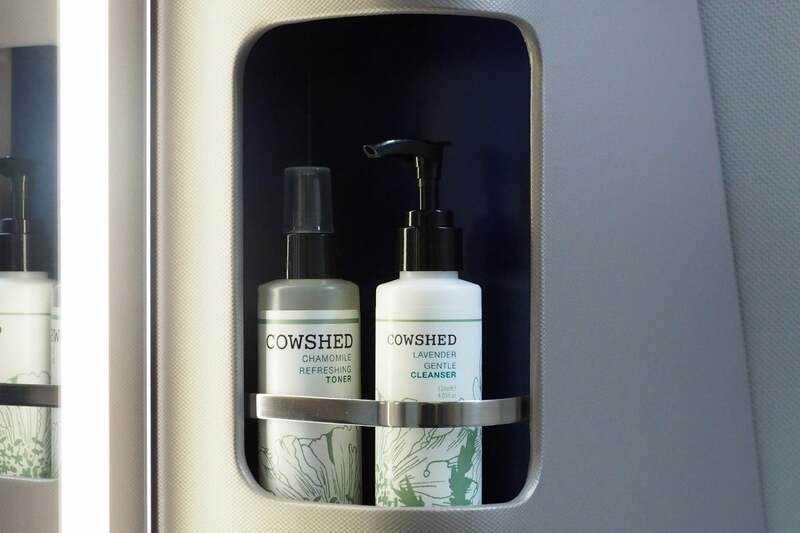 These are available on the longest long-haul flights (including most flights to Asia and the South Pacific), and you’ll probably want to head to one of the lavatories to change. 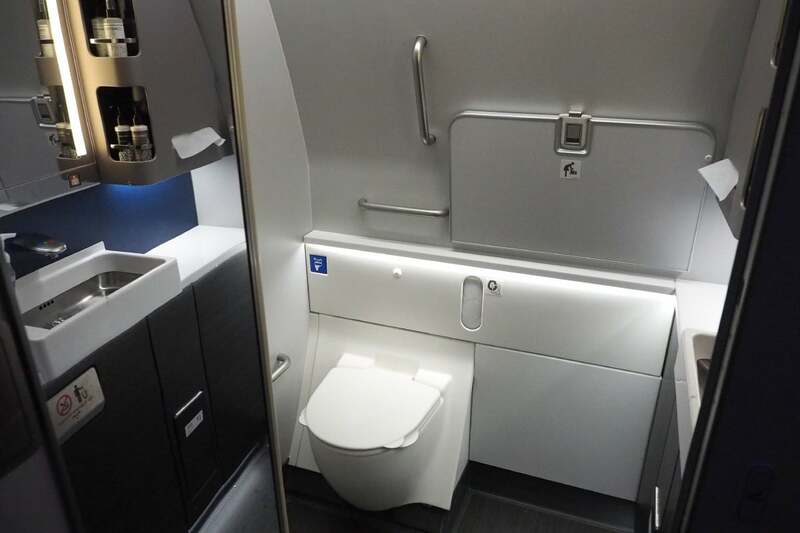 Fortunately, as on some of UA’s 777-200s, Polaris passengers have access to one fairly large lavatory, located just behind door #2. The other lavs are small — a bit larger than those in coach, but not much. In addition to the amenities you’ll receive in your kit, each Polaris lav offers bottles of cleanser and lotion. 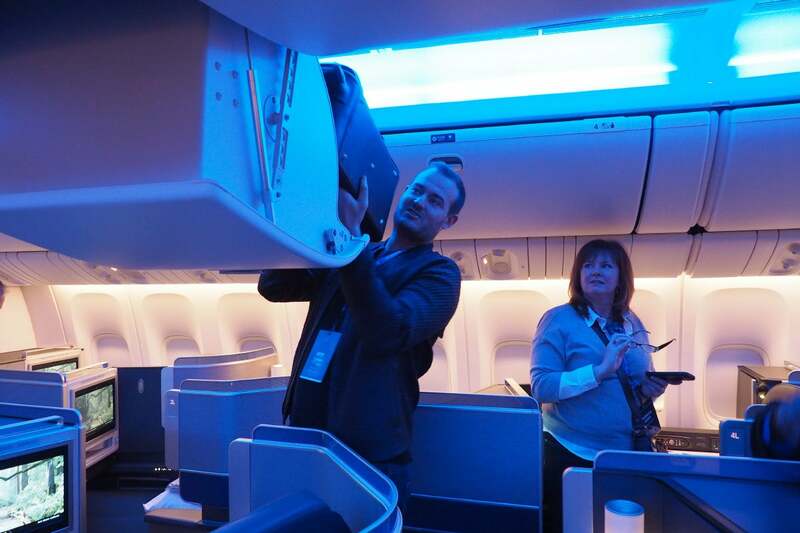 The economy lavs are more bare-bones, but they still felt fresh, given that this is a brand new plane. 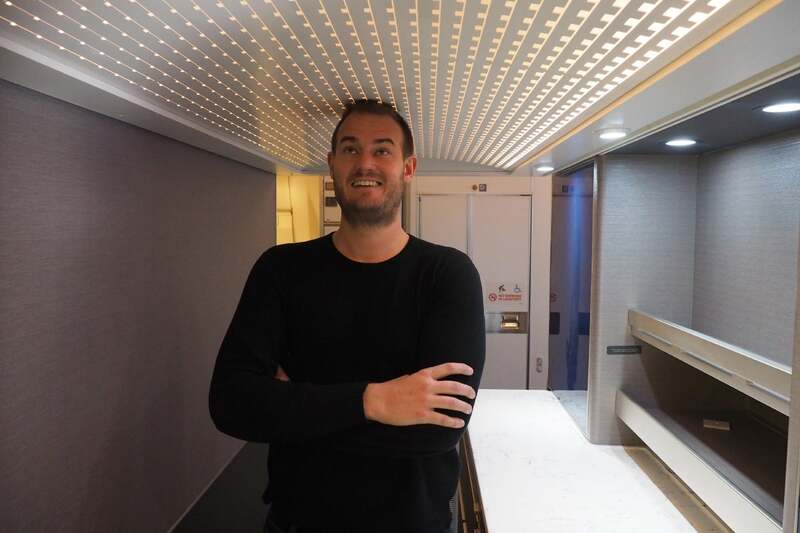 While TPG didn’t have to worry about bumping his head while walking down the aisles, the lower ceiling in the on-board bar area was no match for his 6′ 7″ frame. 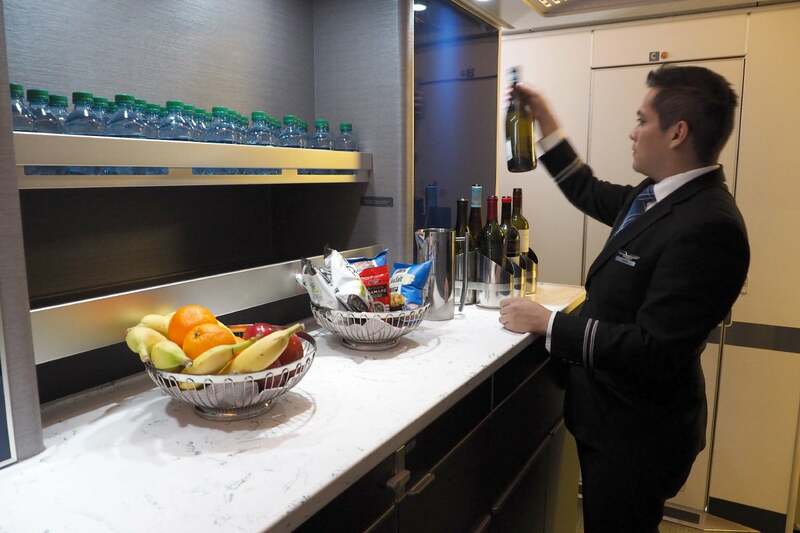 On long-haul flights, this self-serve bar (located between the two Polaris cabins) features fresh fruit, snacks, wraps, water bottles and other items. 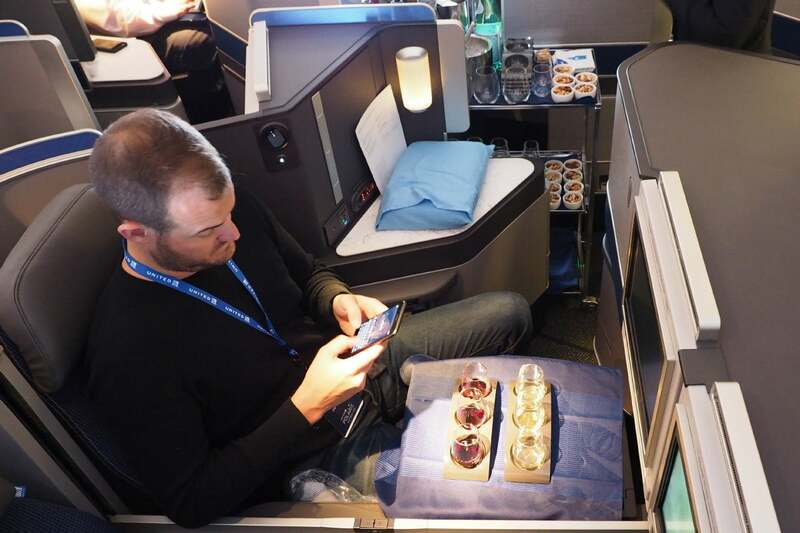 While United’s new Polaris seats are great, this plane actually offers something even better — but you’ll need to head up to the “upper deck,” which unfortunately is only accessible to crew members. Upstairs, you’ll find a half dozen bunks, complete with large mattresses, privacy curtains and the same Saks Fifth Avenue bedding available downstairs. 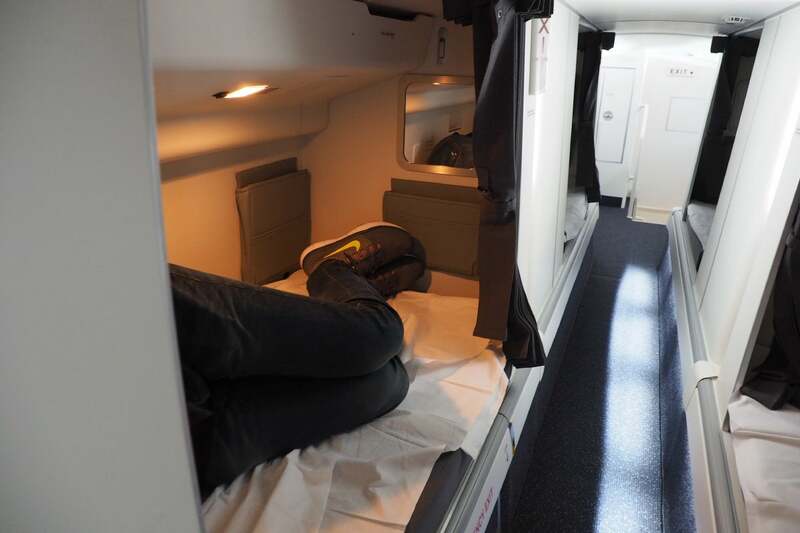 Notably, these bunks weren’t as long as the lie-flat Polaris seats — while TPG was able to stretch out completely there, he needed to bend his knees in the crew bunk. 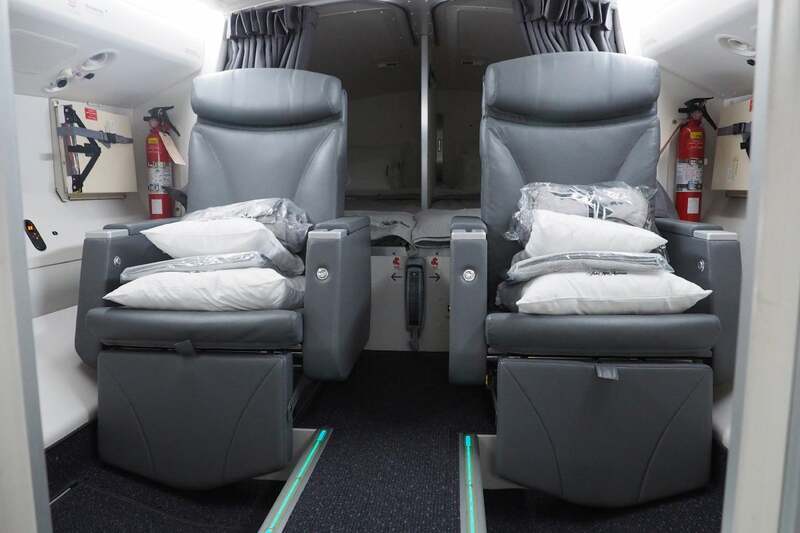 That flight attendant crew rest is located at the far back of the plane — there’s a similar crew rest for the pilots (complete with captains chairs) up front. 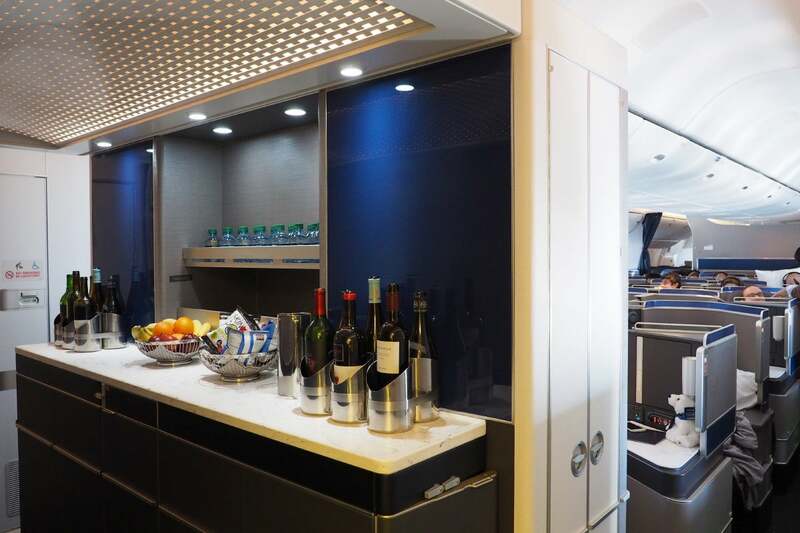 Meanwhile, back downstairs, just behind the second Polaris cabin you’ll find United’s new 3-4-3 coach. It’s definitely a tight squeeze compared to 777s that offer 3-3-3 seating — I’ll dig in a bit more later this week. 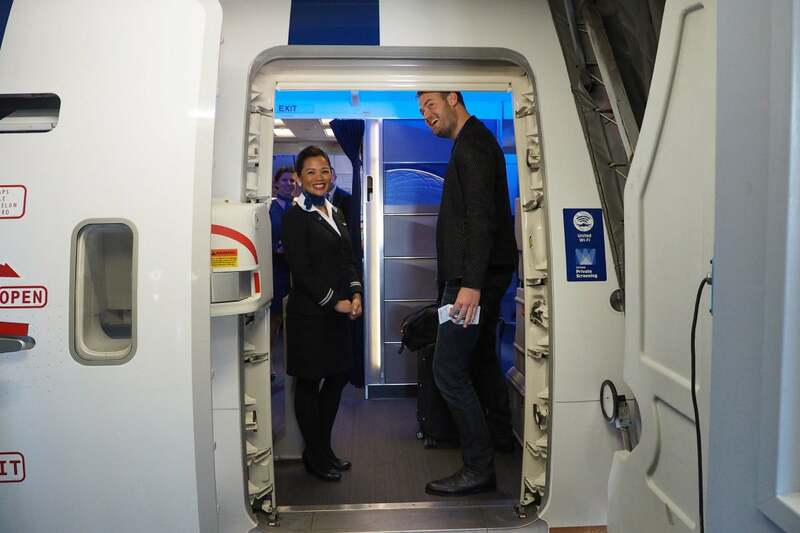 The economy cabins were completely empty for this charter, but they’re almost entirely full for the first passenger flight on Thursday — don’t expect to have room to play around. 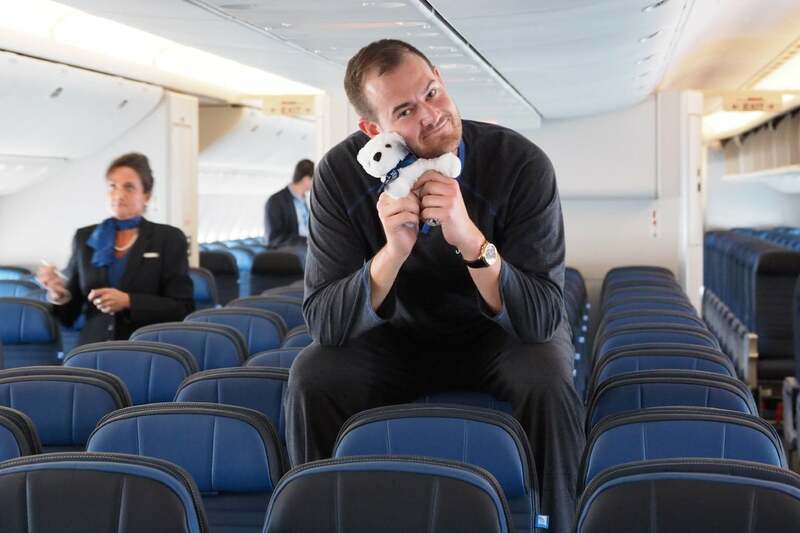 These seats offer enough space to stretch out… as long as there aren’t any other passengers in your row. Seats are roughly 17 inches wide, making the center section 68 inches or so — not enough to accommodate all 79 inches of TPG. 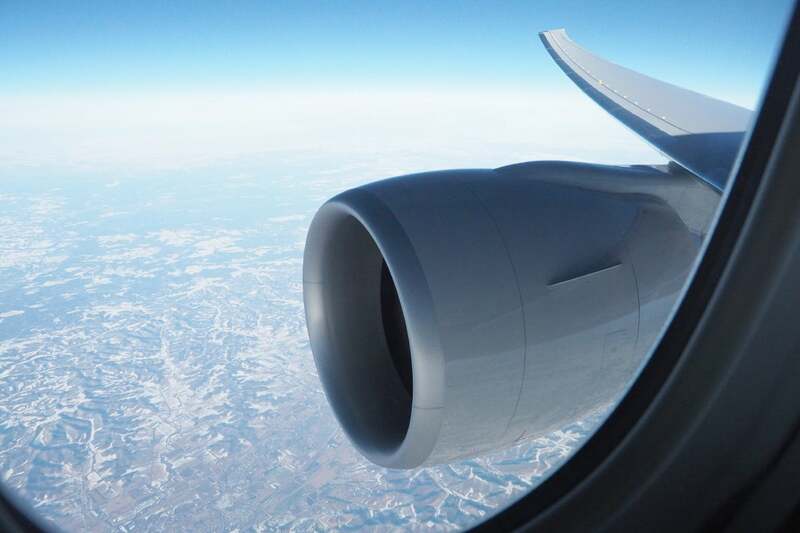 Located toward the front of the coach sections, Economy Plus seats offer a great view of the wing and engine — but they aren’t as quiet as the seats located at the front of the plane. 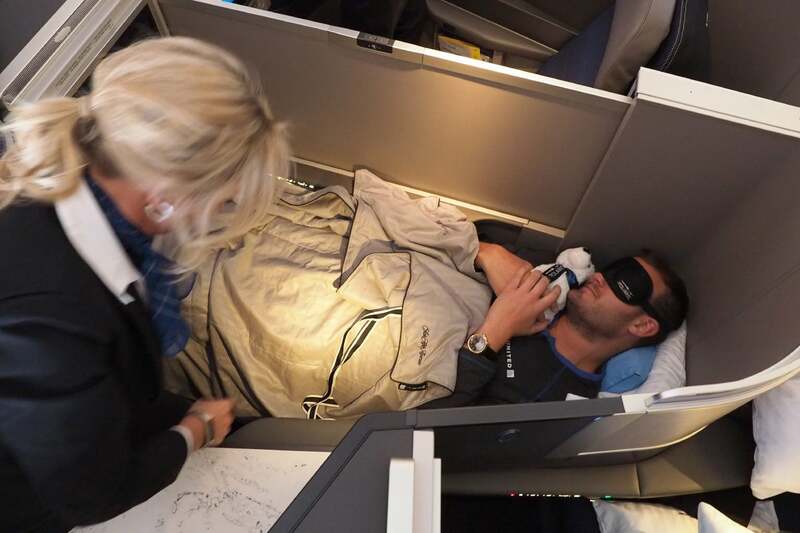 Although we were traveling on a 4-hour domestic flight, United took this opportunity to show off its full international service, starting with amenity kits and Champagne. 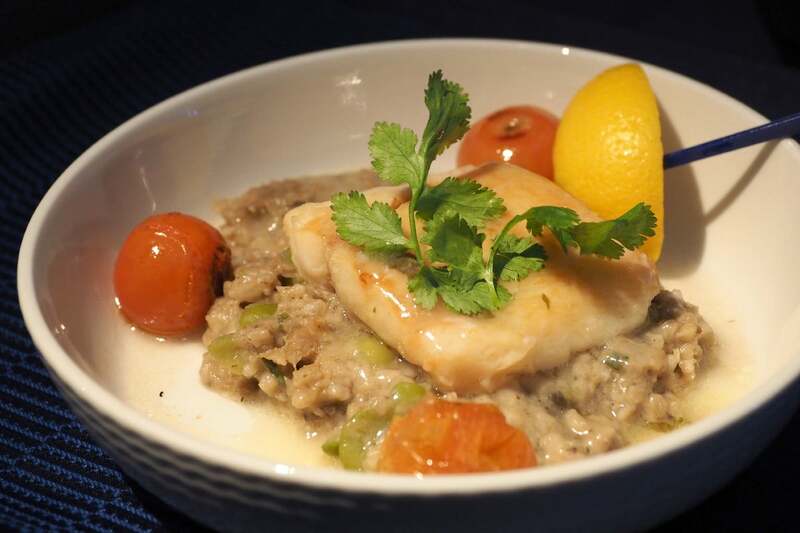 The menu consisted of two starters, an entree, three dessert courses and a selection of a la carte items. 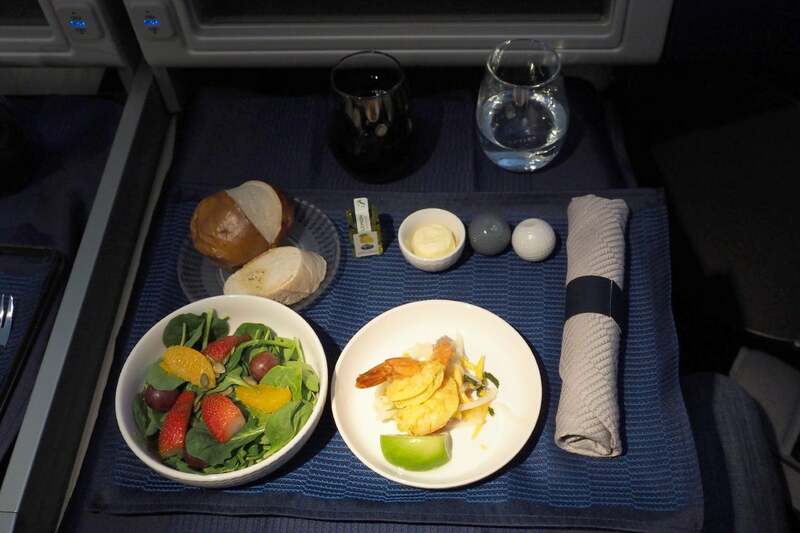 It was a ton of food for such a shorter flight (brace yourself for the pictures to come). 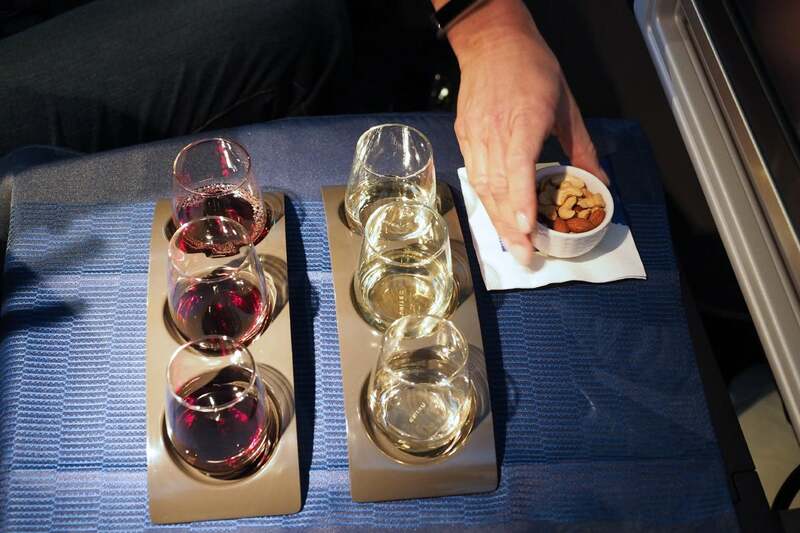 Shortly after takeoff, flight attendants set up each table and offered wine, sparkling (or still) water and warm nuts. 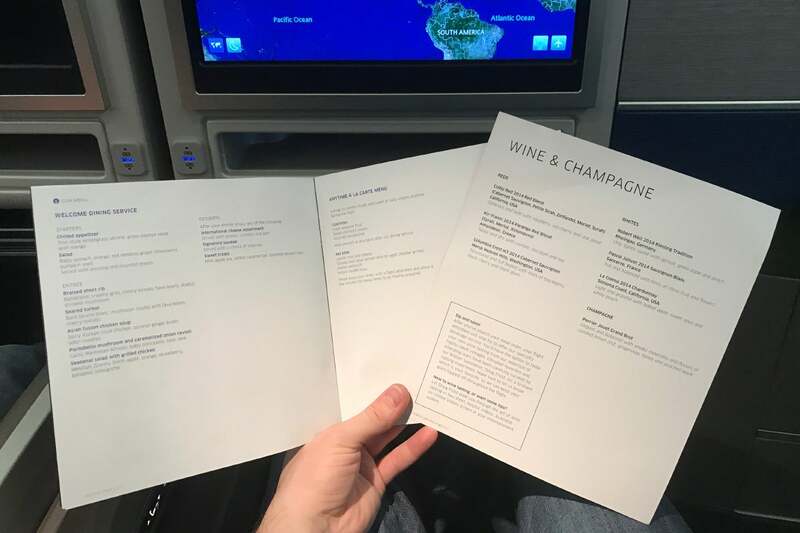 One new addition (available on all Polaris routes) is United’s new wine flight — you can taste three reds, three whites, a mix of reds and whites or all six. TPG decided to sample them all. And he quickly zeroed in on a favorite — the Columbia Crest H3 Cabernet Sauvignon 2014 (about $13 a bottle). 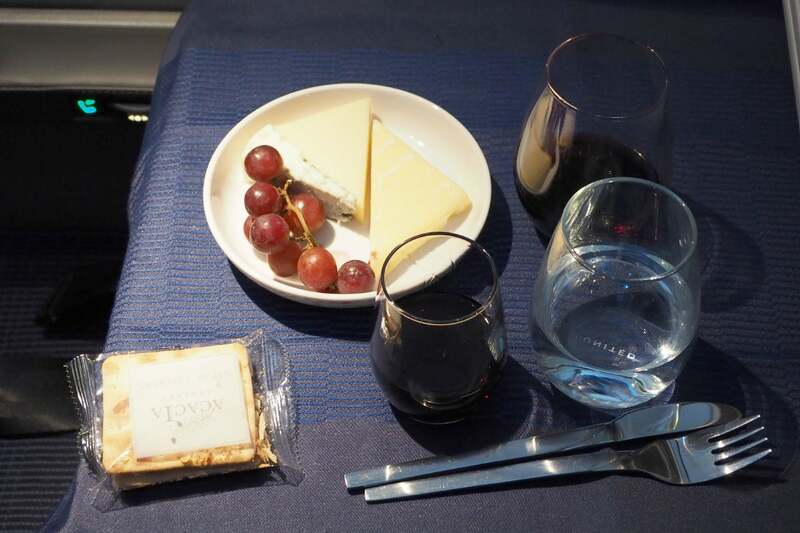 After that delicious wine tasting, flight attendants came by with the appetizer trays, which included a salad, shrimp and warm(ish) bread. As a side note, I’ve actually noticed that the bread hasn’t been as hot following the switchover to Polaris, so I checked in with United’s Executive Chef, Gerry McLoughlin, who explained that the oven preset currently doesn’t allow enough time to heat the bread all the way through. 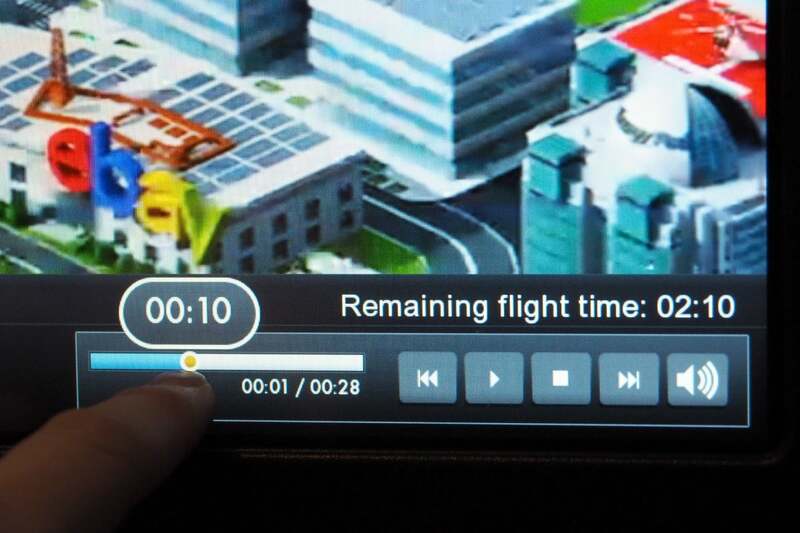 Since flight attendants can’t override the presets, that’ll need to be adjusted ASAP. 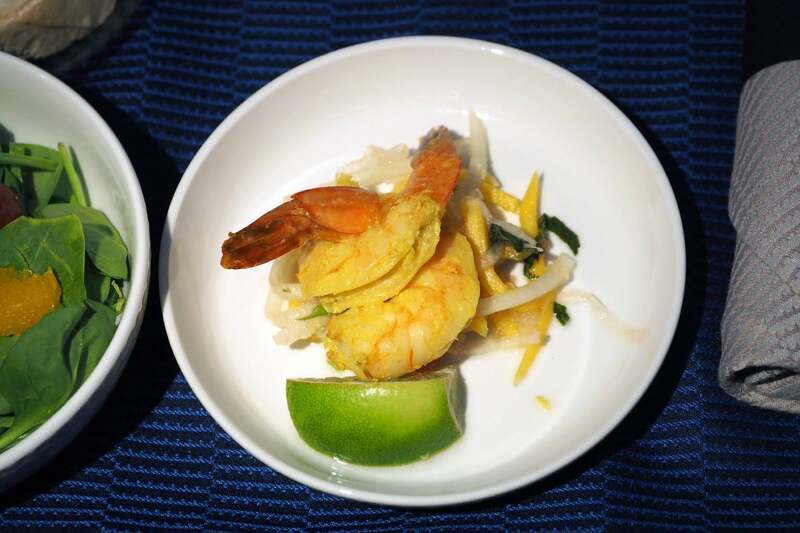 I started with the Thai-style lemongrass shrimp appetizer, which was served chilled with mango and papaya salad. It didn’t blow me away, but it was perfectly edible. 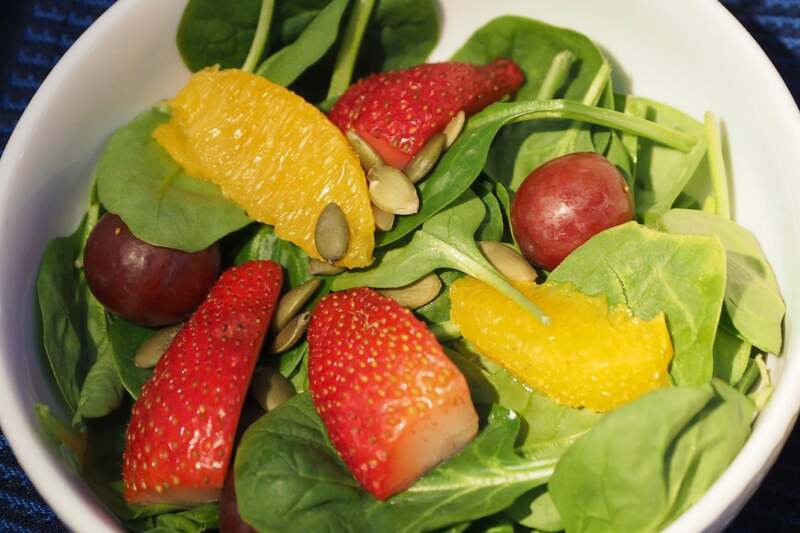 Next up was a spinach salad, with orange slices, grapes and strawberries. The salad was perfectly fresh, and was served with a lemon vinaigrette and fresh-ground pepper. 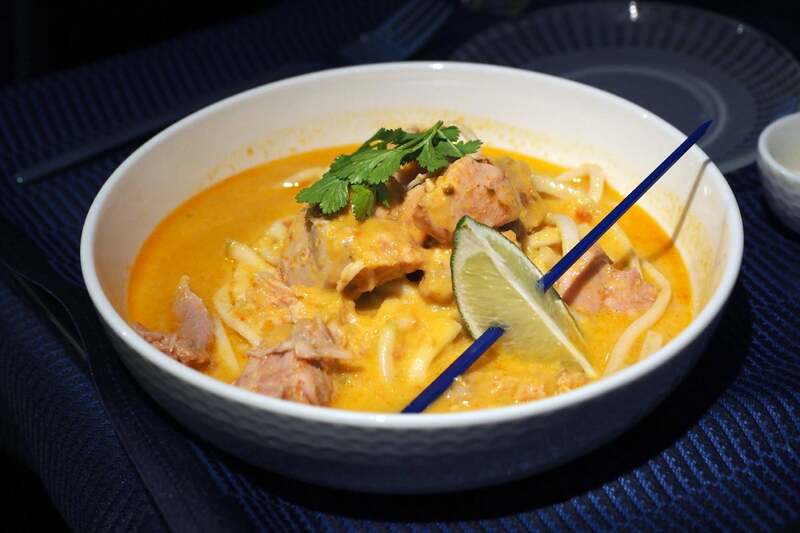 Then, for his entree, TPG selected the Asian fusion chicken soup, which I loved during United’s preview tasting in downtown Chicago but was less impressed with on the plane. It was very good this time, though — TPG finished every bite. The short rib was much better — though it’s hard to mess up a short rib, given the high fat content. 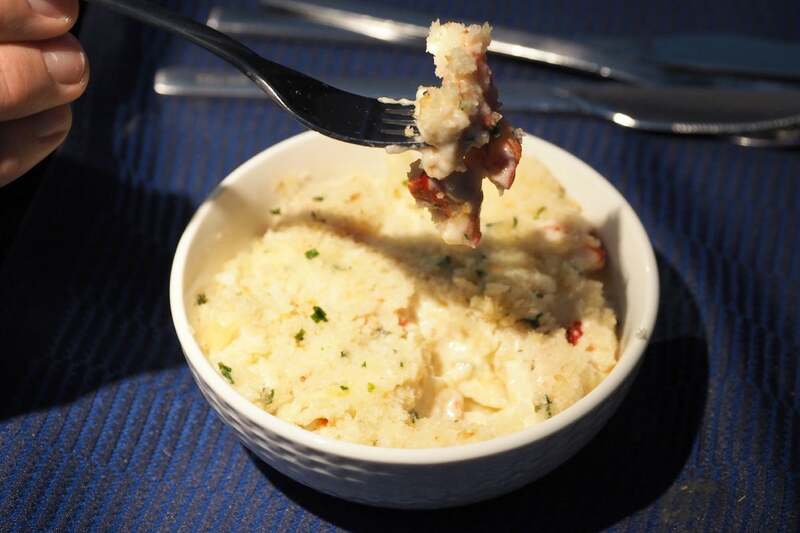 It was served over creamy grits, along with fava beans, cherry tomatoes and mushrooms. 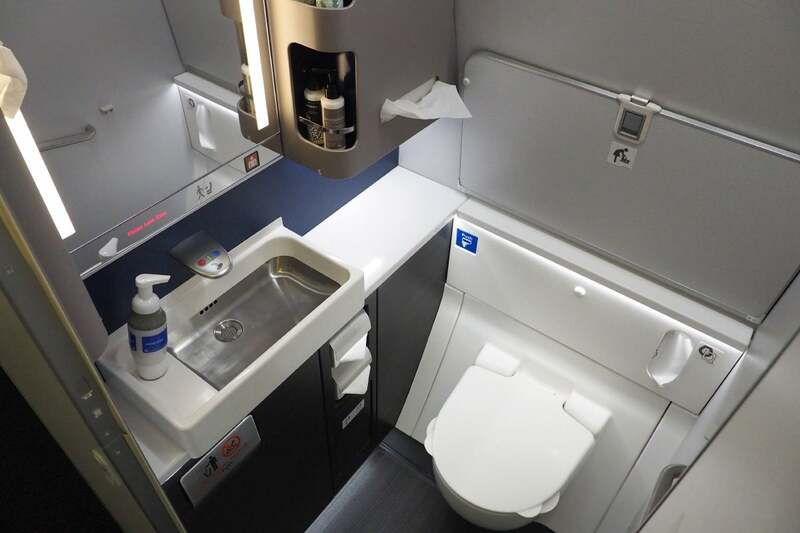 One thing I quickly noticed about the seats is that the tray table can slide back and out of the way, making it easy to get in and out without removing dishes and silverware. 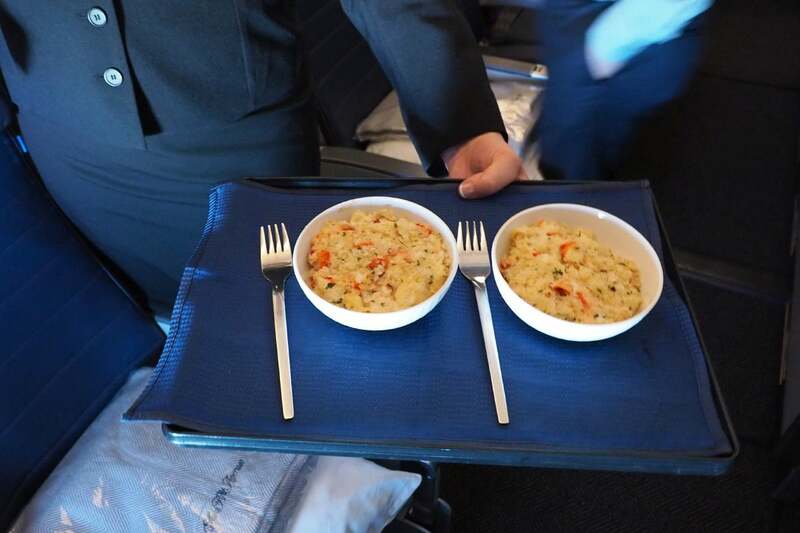 Then, just to be polite, we both decided to try the lobster mac and cheese, which is available as an a la carte snack item on longer flights. There were some serious pieces of lobster here… delicious! That was followed by cheese and port wine. 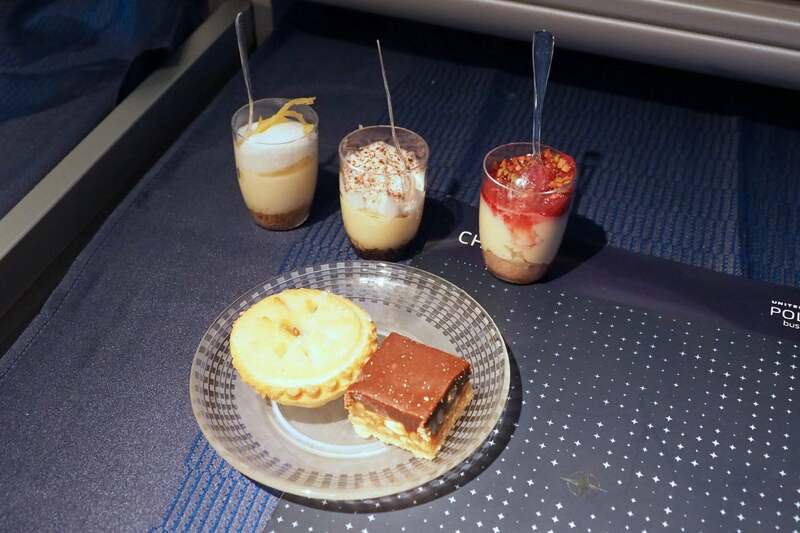 Then a dessert sampler with three yummy cups, a salted caramel bar and apple pie. 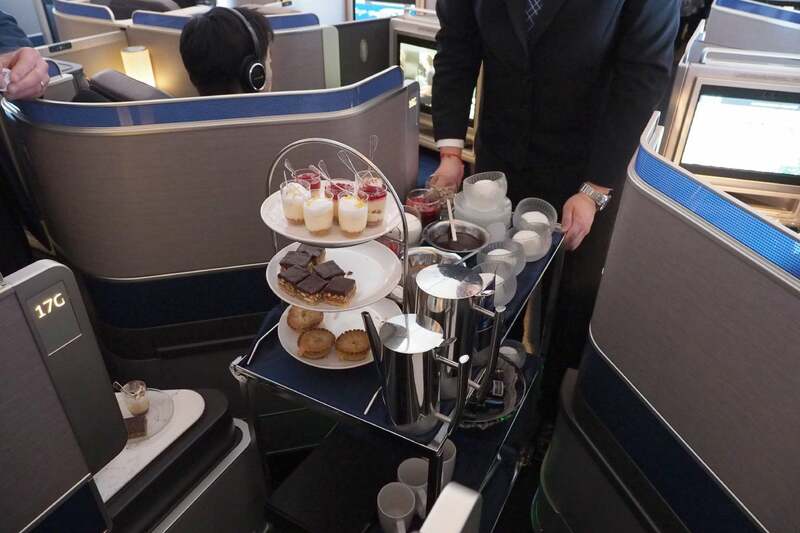 And, as if that wasn’t enough for a 4-hour flight, there was a sundae cart, complete with hot fudge, strawberries and other toppings (stuffed, we decided to skip this third dessert, though). 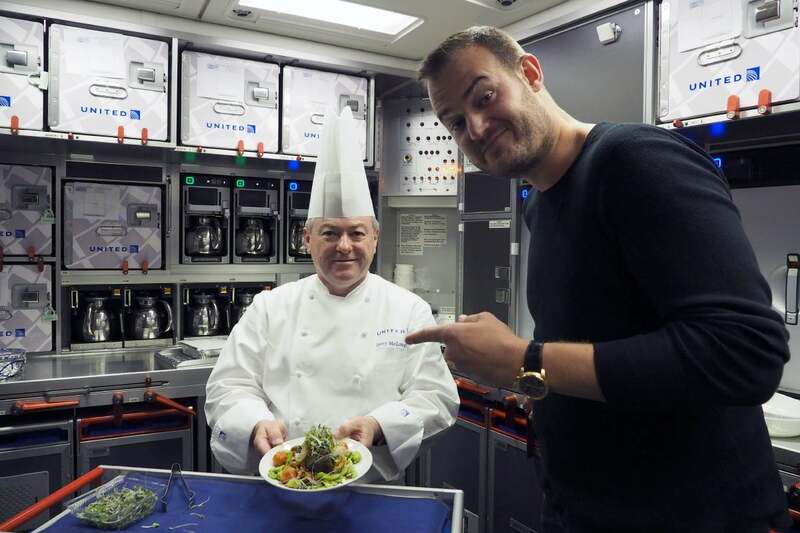 United Executive Chef Gerry McLoughlin happened to be on board for the special flight, and he walked TPG through a cooking plating lesson back in the rear economy galley (stay tuned for that post later this week). 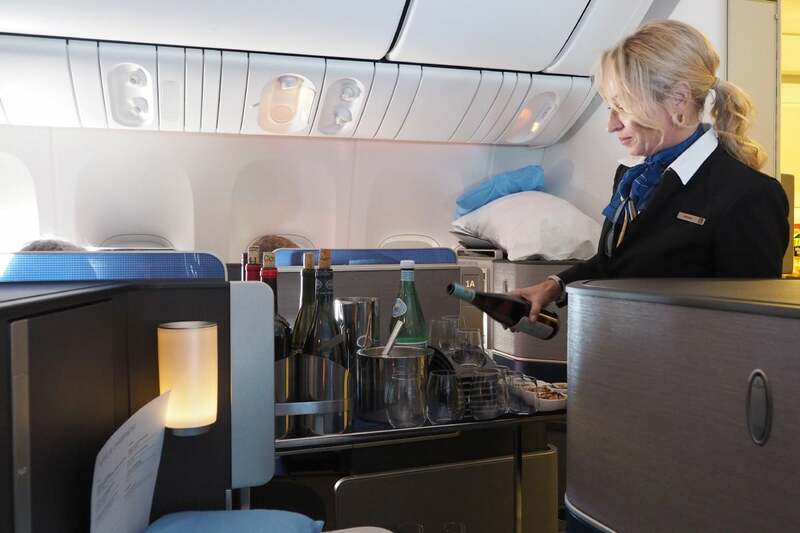 On longer flights, FAs set up the middle walk-up bar area — there wasn’t much to speak of on this flight, but it does offer a nice spot to hang out with fellow passengers during a long trek across the Pacific. 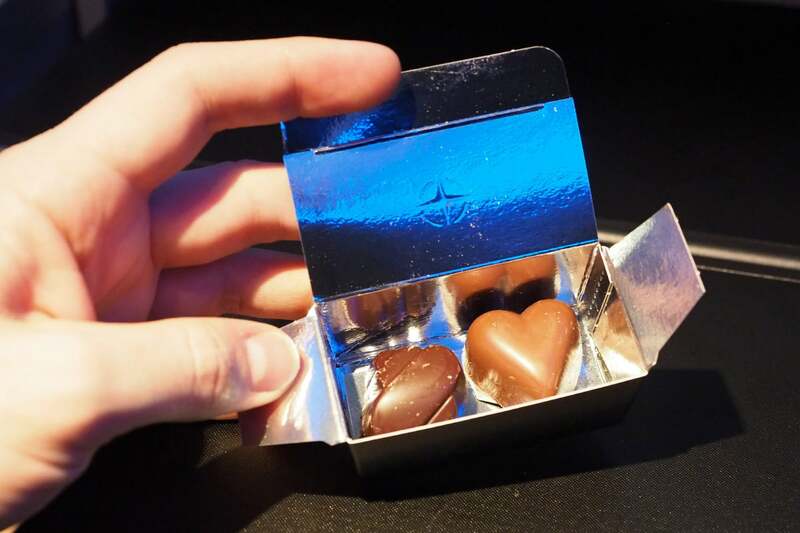 Finally, just before landing the flight attendants handed out a small box of take-away chocolates, just as you’ll receive on scheduled Polaris flights. 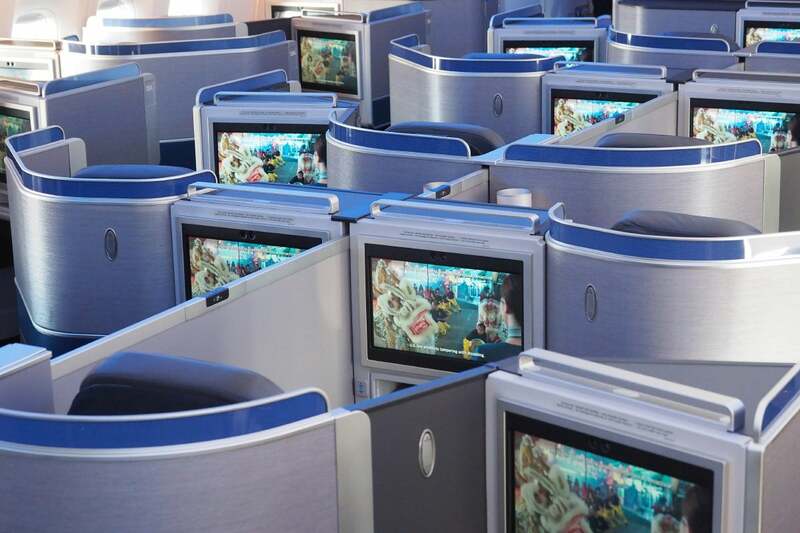 While the content offerings are identical, the in-flight entertainment system is a big step up with these new seats. 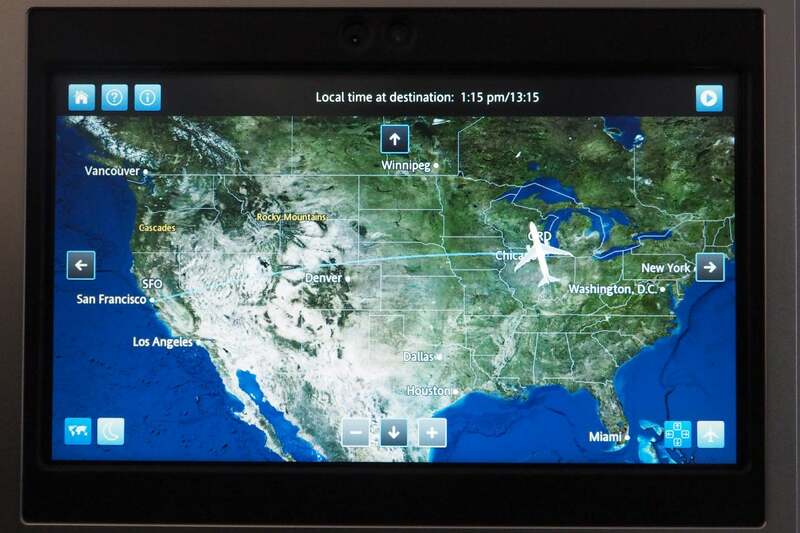 Each passenger gets an 16-inch touchscreen display — it’s not all that much larger than what you’ll find installed in United’s existing business and first-class seats, but it was definitely far sharper. Unfortunately you still get the same so-so headphones. 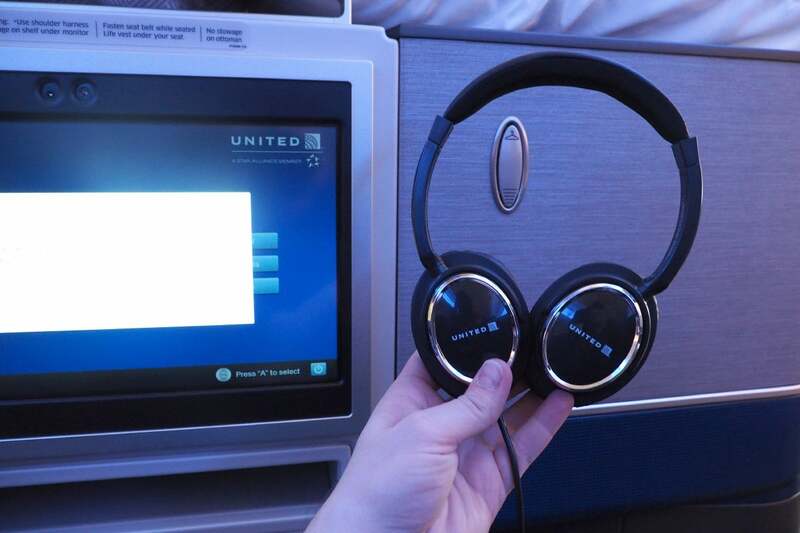 United considered replacing these with a higher-end set, but opted for this model to avoid having flight attendants interrupt passengers to collect headsets and take inventory long before landing (which passengers currently have to deal with when flying on AA). 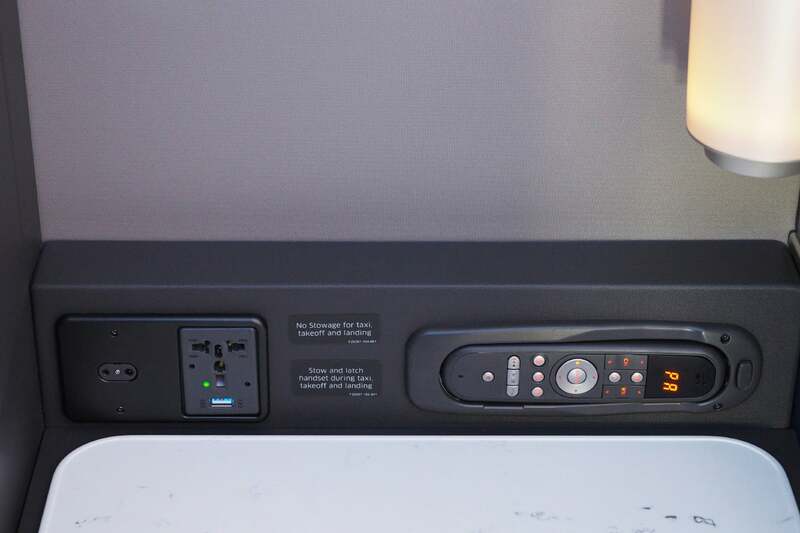 Every seat includes a universal power outlet, a USB port, a headphone jack (that’s compatible with ordinary headphones as well) and a wired remote. There’s a second USB port beneath each display, which you can use to charge a smartphone or tablet that you tuck inside the under-screen compartment. The one major change is a redesigned moving map — you can zoom in and out and pan around. 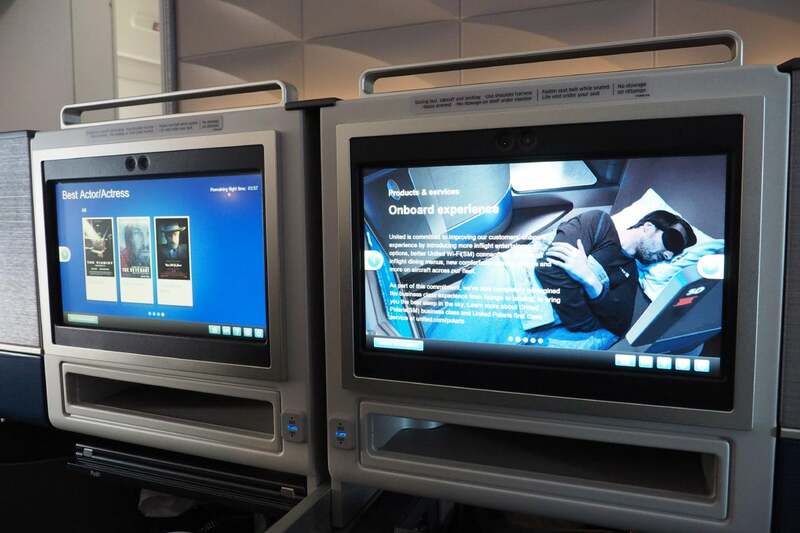 This entertainment system is also equipped with United’s “Channel 9” air traffic control audio, which is only available if and when the pilot decides to turn it on. Another addition is this sliding progress bar on movies and TV shows, letting you skip ahead to exactly the spot you left off on a previous flight. Wi-Fi was entirely free on the flight, which we were initially pleasantly surprised to see. However, it quickly became clear that only “basic” service was available — email worked, but anything beyond that (including posting to social media) was quite a struggle. I never got a speed test to load, so I’ll reserve judgement for the Newark-San Francisco inaugural on Thursday. The very first 77W passenger flight is United 539, traveling from Newark to San Francisco this Thursday morning. 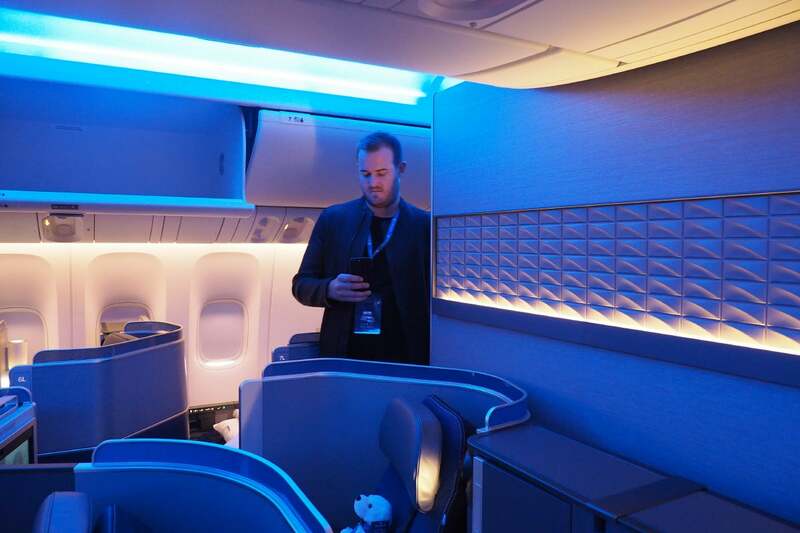 As of this writing, there are five business-class seats for sale, but they’ll run you a whopping $2,642 each. 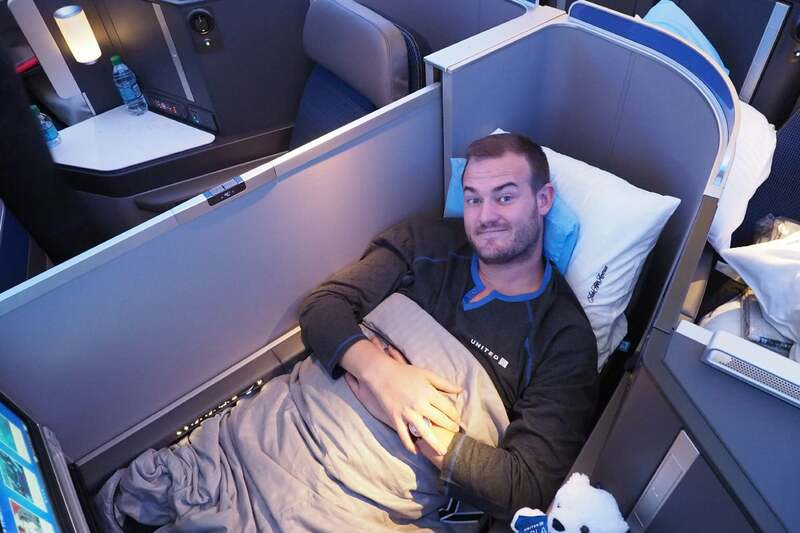 This is a great opportunity to book an award ticket — there isn’t any Saver space for 25,000 miles, but if you’re a United elite member or you have the United MileagePlus Explorer Card, you can reserve one of these seats for 50,000 miles, which also happens to be the current sign-up bonus for this card (after you spend $3,000 in the first three months). 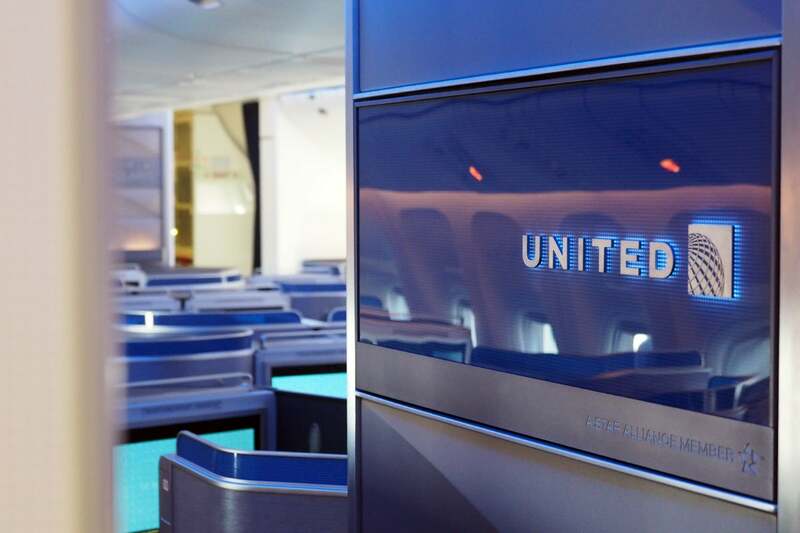 On March 25, United will begin flying this plane between San Francisco (SFO) and Hong Kong (HKG), which, if you’re able to find Saver space, will run you 70,000 miles each way. 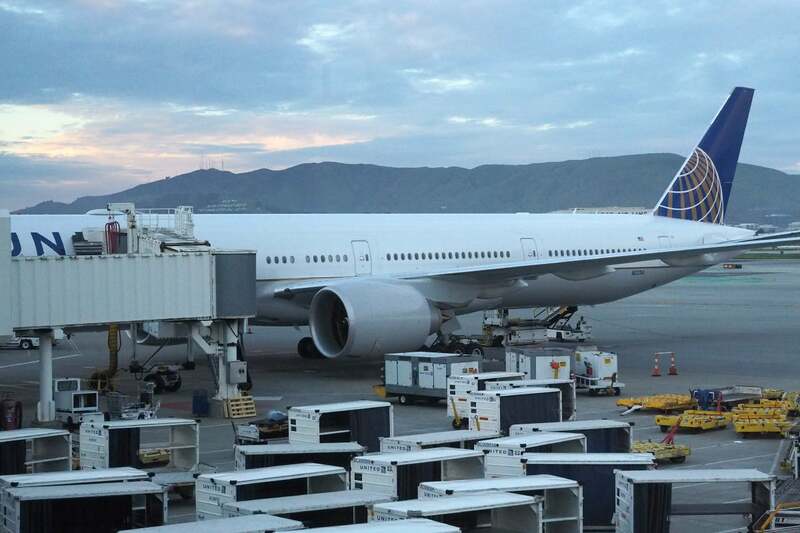 The next destinations have yet to be confirmed, but we’re expecting this plane to operate service between SFO and Beijing (PEK), Seoul (ICN), Taipei (TPE) and Tokyo (NRT), with the possible addition of Tel Aviv. 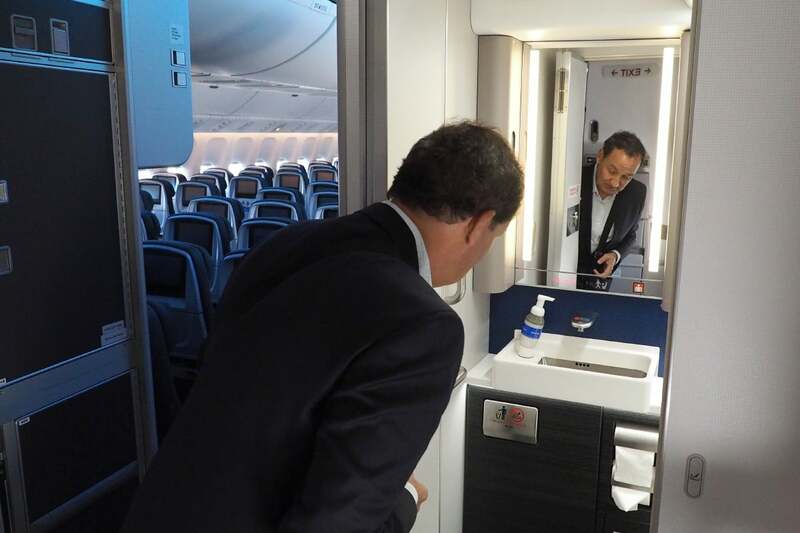 Additionally, it will likely launch on the Newark-Tel Aviv route in early May. 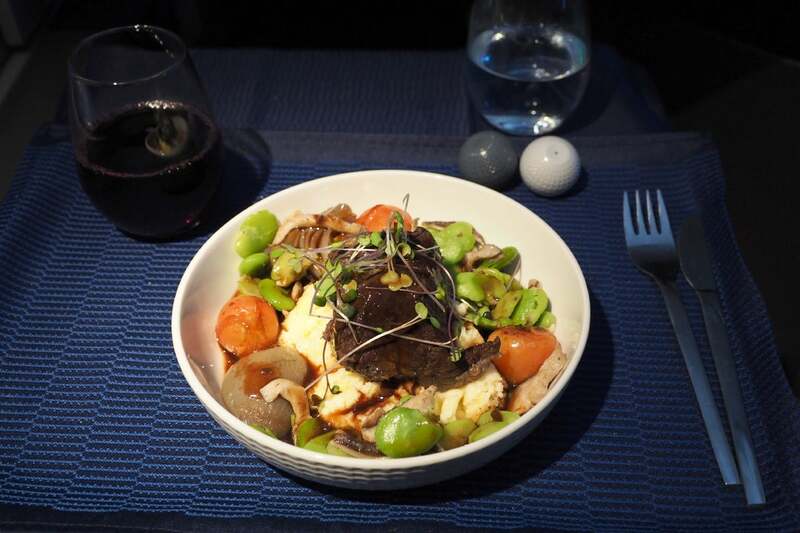 This was a phenomenal first flight on United’s new 777-300ER, but every moment was carefully orchestrated, from the custom menu (only available on this one flight) to the super-friendly (but handpicked) flight attendants. 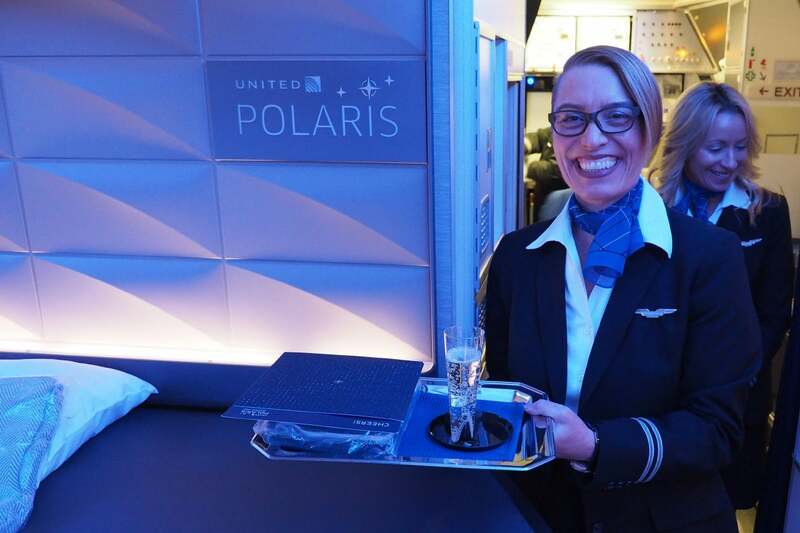 That said, we know that the much-improved hard product will be identical on every flight, and I have two revenue flights booked (including the EWR-SFO inaugural this Thursday) that’ll give us a first opportunity to experience Polaris as it was meant to be. Now that the 77W is here, the challenge for United is managing customer expectations — you’ll pay the same price for a Polaris ticket regardless of whether or not you get the new seat, and the many passengers who have seen United’s television and airport ads will likely be expecting something much different when they end up on a 787-9 Dreamliner or UA’s old 2-4-2 777s. 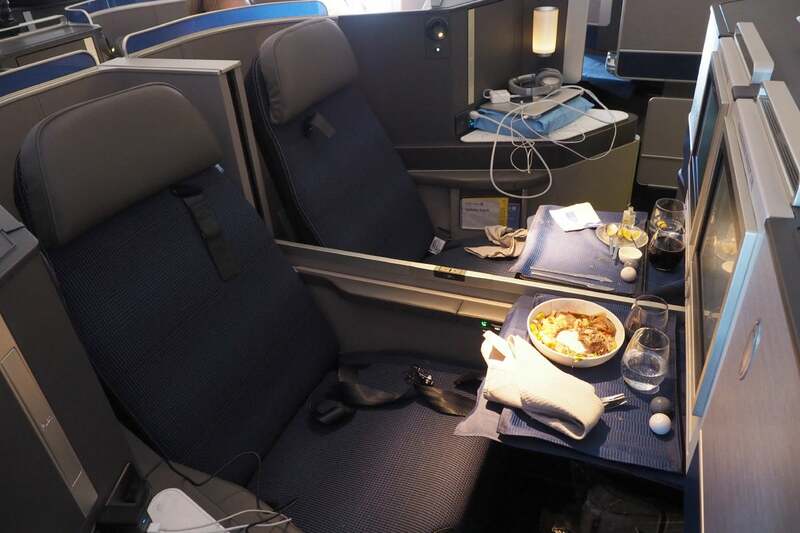 Those of us who know where to find the 777-300ER and how to book it are in for a treat, but don’t assume that every flight will be like this one — given that the old lie-flat seats will remain in service for at least a few more years, the airline has a long way to come before the “true” Polaris product is widely available.